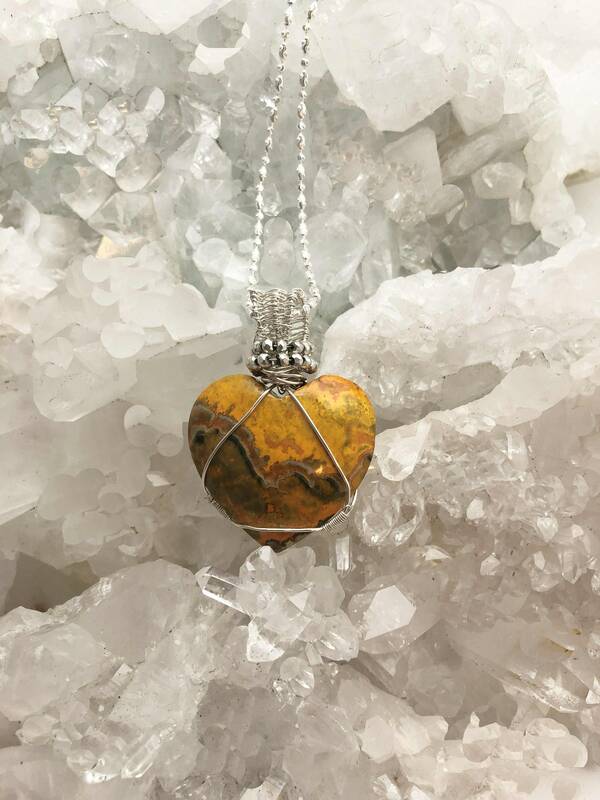 This is a very stunning piece of Bumblebee Jasper in the shape of a Heart. It is wrapped with sterling and hangs from a sterling chain. The color is a swirling variation of yellow, to gold and browns. You will definitely be noticed when you wear it as its color is so unusual. Bumblebee Jasper is a strong earth energy stone, that embodies within it the strong energy of the volcano from which it was born. 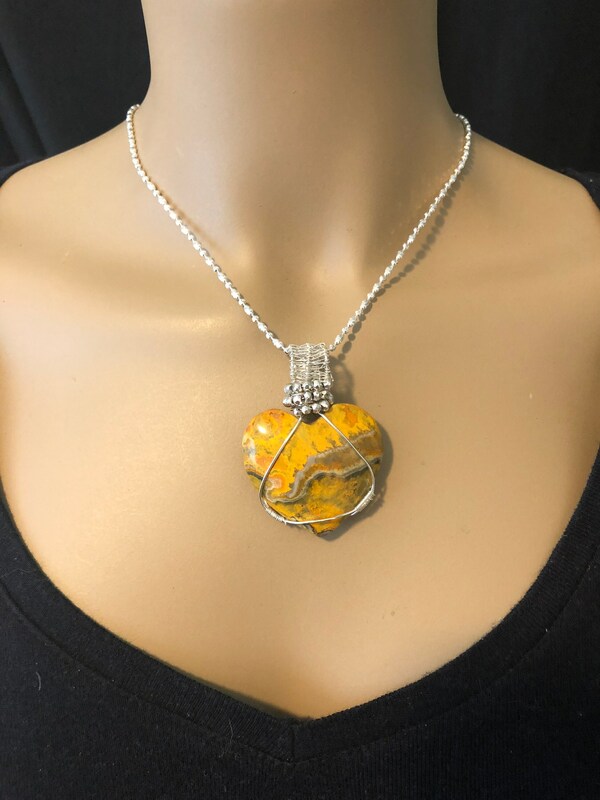 Bumble Bee Jasper enables you to accept change, to find new opportunities, increase your self-esteem and help make decisions without relying on emotions. It enhances your creativity and gives one confidence. It is said to assist the impossible to manifest, so it is worth having one in your environment. It can bring joy into ones life. 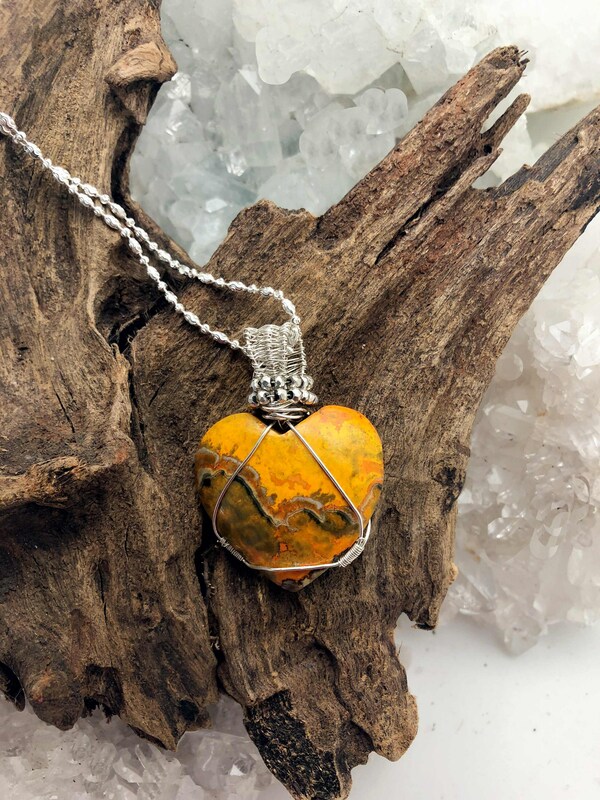 Metaphysical healing lore says that Bumble Bee Jasper can help with abdominal issues, infections, allergies, the nervous system, and heart and circulatory system disorders. It can increase your physical vitality. Bumble Bee Jasper is associated with the the Sacral and Solar Plexus chakras. Bumble Bee Jasper or Bumblebee has lovely patterns that often imitate the coloring found on bumblebees. It is actually a combination of volcanic matter, anhydrite, hematite, sulfur, arsenic, etc. Bumble Bee Jasper is a rare stone that was formed where a volcano opened to the earth. It is also known as Eclipse stone and as Fumarolic Jasper. It is not a true jasper because it does not consist primarily of microcrystalline quartz. It is a technically a rock that has formed from sediment deposited by water or air. It contains varying amounts of sulfur, manganese oxides, the arsenic-sulfide minerals realgar and orpiment, and the calcium-carbonate minerals calcite and aragonite. It forms in volcanic gas environments and is a porous, layered, multicolored rock that is cemented together by carbonate minerals. Its yellow layers are due to sulfur, orange to arsenic sulfide minerals, and the black to manganese oxides.